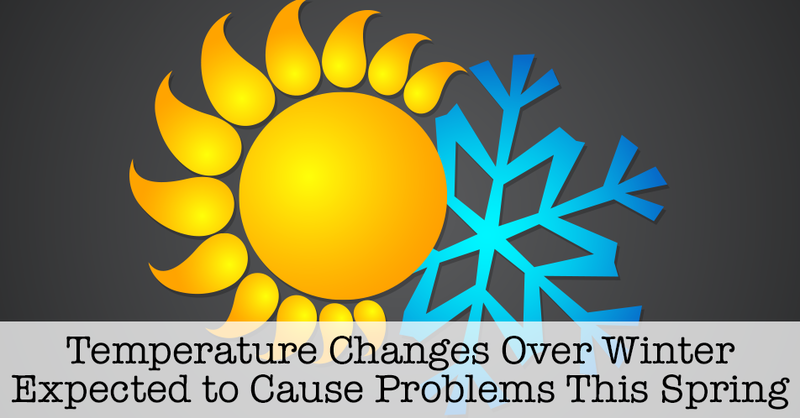 Temperature Changes Over Winter Expected to Cause Problems This Spring – The Natural Way, Inc. In just the last four months, we have had two record-breaking temperature swings. These temperature swings can impact trees in negative ways. 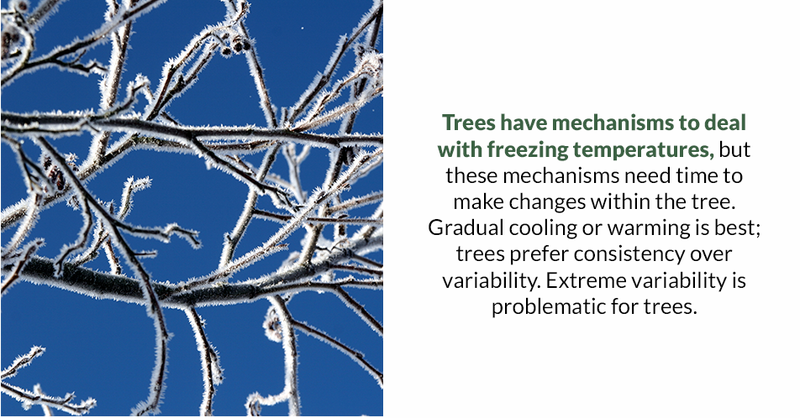 Trees have mechanisms to deal with freezing temperatures, but these mechanisms need time to make changes within the tree. Gradual cooling or warming is best; trees prefer consistency over variability. Extreme variability is problematic for trees. Over the span of October 25-27, the temperature went from 84° to 13° for a swing of 72 degrees. Denver metro experienced another recent temperature swing of 72 degrees, going from 69° to -3° from February 18-20. Trees increase levels of sugars, proteins, and other compounds within cells to reduce the freezing point within their cells. Water is also moved to intercellular spaces to avoid freeze damage to cells. Adjusting water and the sugar/proteins/compounds within cells takes time as does moving water out of cells. Rapid temperature changes don’t allow for sufficient time for these processes to occur and damage can occur. Damage is worse in fall and spring when trees are adjusting to larger changes in daylight and temperatures. However, damage can occur even mid-winter if temperatures are not within normal ranges for long periods of time. Sunlight plays a part in these temperature swings as well. Ambient air temperatures may be drastically different than the temperature of the bark, especially on dark colored bark. The bark temperature may heat up 10 or 20 degrees warmer than the air temperature. Variations from the north and south of a trunk may also have significant temperature differences. Tree roots can be affected as well by temperature swings. Some studies have even shown roots to be more prone to temperature variations than the trunk and branches. Preventing or reducing damage can be done several ways. Properly watering trees in winter can help reduce winter damage but be sure to avoid watering trees right before a large temperature swing. Wrapping thin-barked trees is another way to mitigate damage. Three to four inches of mulch under the canopy of a tree can reduce root damage by creating a protective “blanket” to help protect roots from damage. Anti-desiccant sprays can also help reduce damage to needles and leaves of evergreen trees. Need assistance taking care of your trees? Give us a call today at The Natural Way to learn about our services and how we can help.